New extension deadline!! 12 Nov 2018. !! We are pleased to inform that Southeast Asia Global Innovation Challenge (SEA-GIC) is coming back. The competition is open to all undergraduates student in ASEAN region. Our main objective of this event is to allow participants to bring innovative ideas to solve real-world problems. The theme for this year is “Sustainable Energy, doesn’t cost the earth’ which allows participants to address the global sustainability issues via innovative solutions and educational approaches. Due to many request, we have decided to extend the submission deadline of SEA-GIC 2018 to November 12. The participants will be required to register through https://tinyurl.com/seagic2018 before 12th November 2018 with no registration fee. 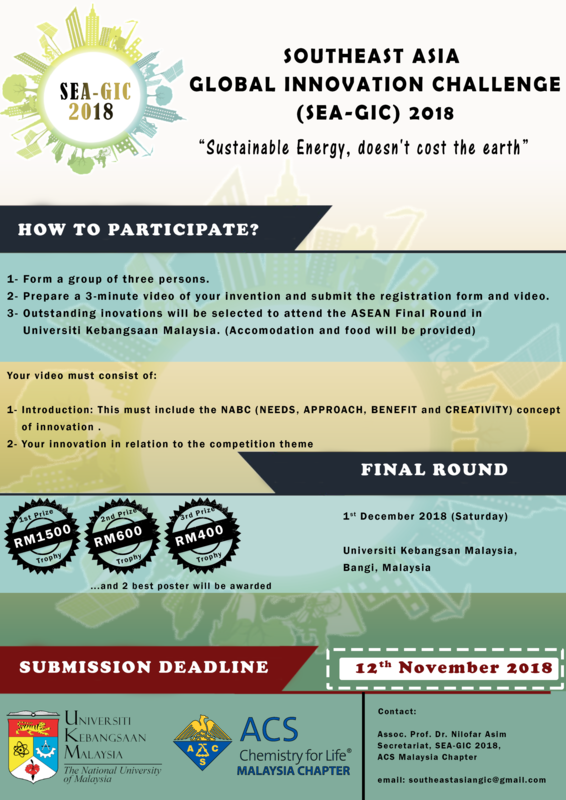 The finalists for SEA-GIC2018 will be selected from preliminary round and will convene in Universiti Kebangsaan Malaysia to pitch their innovations to our distinguished judges on 1st December 2018. Come and join us now! We would greatly appreciate if you can disseminate the information to your colleagues, students or anyone who may be interested to participate in this competition. If you have any inquiries, please do not hesitate to email southeastasiangic@gmail.com.